We celebrate Valentine's Day on 14th of February - Amongst the mountains of mass-produced gifts it's difficult to source a truly romantic Valentine's Day gift. 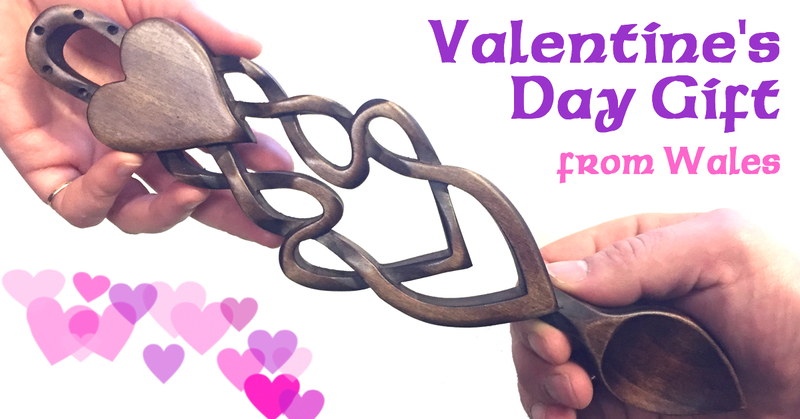 We recommend our Welsh Lovespoons as a gift of love for that special person in your life. The 'Valentine Love Spoon' (035) and the 'Celtic Love Spoon' (001) are perfect Valentine's Day or St Dwynwen's Day gifts, but we also have many more for you to choose from - see the full list below. We can even add a name, date or special message to your hand carved love spoon for no extra charge. We can either send the personalised Love Spoon directly to you so that you can present it personally to your Valentine and see her/his joy and surprise for yourself, or we can send your Valentine Love Spoon directly to your Valentine and enclose a printed Card. Please add a comment with your order to request the card and tell us what you would like written on it. All orders are sent within 2 working days. Click on these links for more information about the unique Welsh custom of giving Love Spoons as gifts - Symbols & Meanings - Carvers - History - Pyro-Engraving - Wood & Finish and press here to read more about the history of Valentine's Day.